L-Glutamine - Top Quality bargain price. L-Glutamine (Glutamine) has it's devoted followers, and seems to be increasing in popularity amongst weight trainers and athletes the like. Some companies market L-Glutamine as a "Muscle Builder" however, it seems to have more evidence to support it's use as an anti-catabolic agent. i.e. has more benefit for reducing muscle wastage / breakdown in the face of reduced calories (fat loss diet). It is also claimed to boost the immune system, especially important in very heavy training schedules by lifters and athletes alike. Glutamine (L-Glutamine) isn't a supplement I take regularly, however my training isn't as intense as it once was. needless to say, should I ever get back to training "excessively", I would more than likely add Glutamine to my daily supplement arsenal. Check out Reflex Nutrition's details below. The amino acid, Glutamine, has become more prominent as new studies reveal its unique contribution to protein synthesis (muscle growth), anti-proteolytic (prevents muscle tissue breakdown) functions and growth hormone elevating effects. 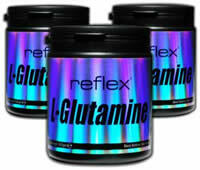 Glutamine is the most abundant single amino acid in the blood and in the intracellular free amino acid pool (most abundant amino acid in muscle tissue). It comprises 61% of the amino acid pool in skeletal muscle. Glutamine's unique structure, containing two nitrogen side chains, consists of 19% nitrogen - making it the primary transporter of nitrogen into the muscle cell. In fact, glutamine alone is responsible for 35% of the nitrogen that gets into the muscle cell. Glutamine literally drives muscle building nitrogen into the muscle cell where it is synthesized for growth. Glutamine concentrations fall markedly after training and remain low until complete recovery. What this means is, the very rigours of weight training leak nitrogen carrying glutamine from muscle tissue. This fall in glutamine is catabolic to muscle tissue. Supplementing with glutamine spares free glutamine in muscle tissue, counteracts the fall in muscle protein synthesis, and improves nitrogen balance. Suggested use: Take 5 grams before and after training, and another 5 grams before bedtime for optimal results. L-Glutamine - Immune system support. L-Glutamine - Anti-Catabolic muscle preservation properties.